Pictured L to R Jack , Scott and Cat. Tögnar was established in 1986 by Jack*. Jack's son Andy, an avid snowboarder, suggested the name "tognar" a commonly used portmanteau of the words totally and gnarly. In 2004 Scott and Cat began managing the business for Jack and the fit was perfect. In 2007, when Jack was ready to pursue other adventures, he sold the business to them. Scott and Cat currently run tögnar from a cozy warehouse in Ashland, Oregon, nice and close to three beautiful ski areas Mt. Ashland, Mt. Shasta and Mt. Bachelor and plenty of prime backcountry. Scott spent his formative years in Mt. Shasta, Tahoe and Australia as a vagabond ski tech. Working in various ski shops, including The Fifth Season in Mt. Shasta, Northstar at Tahoe and Blue Cow Resort in Australia. Cat moved from Australia to the USA in 1989 and has enjoyed the variety of four seasons (especially the white one) ever since. We appreciate all the friendly and faithful customers we've had over the years that has made tögnar a favorite one-stop shop for ski and snowboard tuners around the world. *(originally The Third Hand, also selling Bicycle tools). 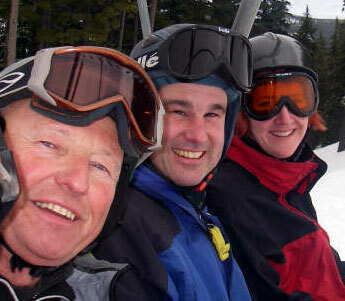 The ski aspect of the business was prompted by Jack's acquaintance with two people, Doug Couture and Blake Lewis. At that time, Blake had earned acclaim as the ski tech for Bill Johnson, a member of the US Ski team who won the Olympic mens downhill in Sarajevo 1984. As a result, Blake and Doug were on a national tour teaching ski tuning clinics, and wanted to sell ski tools during the clinics, so they asked Jack if he could provide the tools. He said yes, but also offered a much larger selection of tools in a new catalog, still under "The Third Hand" name. Jack sold the bike tool business to Jeff and Jeannie Gilmore, who have since renamed it Loose Screws.